I was in Amsterdam this past fall when I happened on my bike’s Dutch doppelgänger on one of the 9 Streets. It’s an earlier model than mine; I’m guessing 1950’s because of the chaincase. It’s been well maintained and has gotten a lot of use, if the additions are any indication. Over time someone has taken this quintessentially English bike and made it Dutch. The fork is a replacement, which probably means it was once in a head-on crash. This is a testament to the durability of steel, that the frame survived unscathed. The stem has been swapped for a longer one in order to get the bars into a more upright riding position, Dutch style. 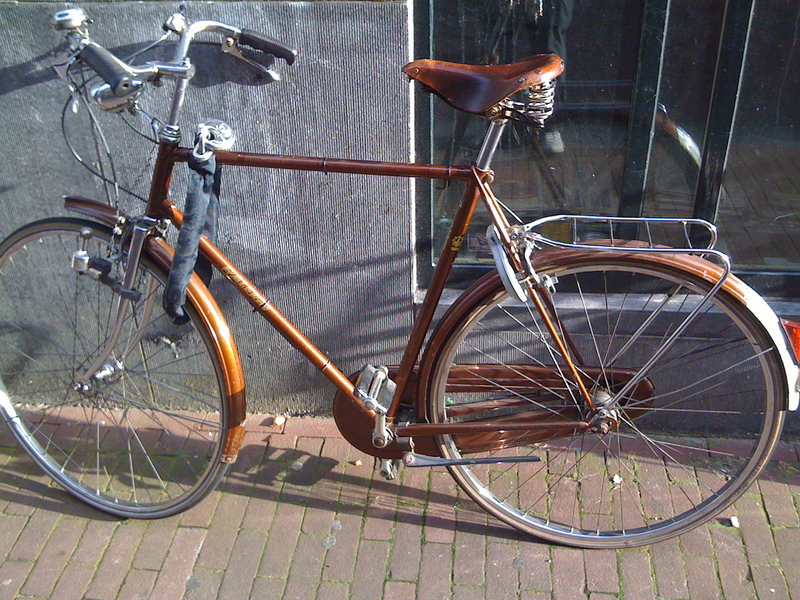 The rack is an add-on, as is the rear wheel lock, which is standard on every bike in the Netherlands. The bottle generator up front is clamped to the fork with a part similar to what I have on my seat stay. Usually if a generator goes on the front fork, it’s attached to a braze-on mount with a vertical opening made especially to hold a generator against the force of the turning wheel.